When I was younger, my dream was to be an astronomer or an astrophysicist. This dream followed after the reality set in that my chances of becoming an astronaut were relatively slim. Even now, I still love looking at the sky. I have been known to lay outside on the grass for hours, watching the night sky change. I’ll even sit outside in freezing temperatures to watch for meteors or just enjoy the stillness that comes with a diamond-laden sky. What’s cool right now is that we are coming up on what is known as a lunar eclipse tetrad. For the next two years, there will be a lunar eclipse over the Western Hemisphere every six months. This is also the first total lunar eclipse visible over the Western Hemisphere for more than two years. For sky-watching nerds like me, this is all sorts of awesome. A lunar eclipse takes place when the sun, earth, and moon line up just right so that the earth comes between the sun and the moon. Normally, the moon reflects the sun’s light back to us, looking bright. However, during an eclipse, the earth gets in the way. The sun’s light has to go through the earth to reach the moon. What happens is that the sun’s light is refracted (bent) as it shines through the earth’s atmosphere. This refraction creates an effect that creates red light. This red light is then cast upon the moon, and that is what is reflected back to us. It’s all about angles (incidentally, this same refraction is what makes the sun appear red as it sets). As the earth — and it’s light-bending atmosphere — comes between the sun’s light and the moon, you can watch the transformation of the moon’s color from gray to red. A total eclipse of the moon is awesome to watch, and you don’t need a telescope to get a good show. 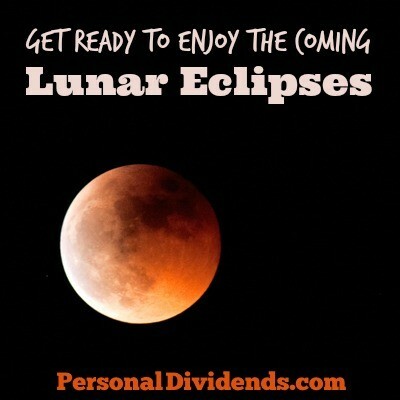 Indeed, there is a good chance that you will be able to see the upcoming lunar eclipse, which takes place overnight on April 14-15, 2014, pretty well. The total lunar eclipse should be in effect at 3:46 Eastern Time on the morning of April 15. The actual appearance of the moon will depend on the amount of dust in the atmosphere at the time of the eclipse, and where you are located. The good news is that those of us on the North American continent should see it pretty well, no matter the location. Of course, if there is a lot of light pollution in your area, or if it’s cloudy, you might not get to see the lunar eclipse. If that is the case, you can go online and watch via SLOOH Community Observatory, which is located in the Canary Islands. However, if you can, it’s so much cooler to watch “in person,” though. Even if you have to get up in the wee hours, it’s worth the trouble. In fact, I’m thinking of waking my son so he can experience the awesome with me this time around. I got to see some of the eclipse! It was amazing. It is truly wonderful to see such natural phenomena. It truly helps us appreciate our place in the universe. Thanks for the post!